Get outdoors at St. Kilda Beach and Royal Botanic Gardens. Spend the 19th (Fri) wandering through the wild on a nature and wildlife tour. Next up on the itinerary: admire nature's wide array of creatures at Melbourne Zoo, get engrossed in the history at Shrine of Remembrance, enjoy breathtaking views from Eureka Skydeck 88, and grab your bike and head to Catani Gardens. For ratings, more things to do, other places to visit, and other tourist information, you can read our Melbourne trip maker website . Sydney to Melbourne is an approximately 3.5-hour flight. You can also do a combination of flight and shuttle; or drive. In April, Melbourne is little chillier than Sydney - with highs of 23°C and lows of 11°C. Wrap up your sightseeing on the 20th (Sat) early enough to travel to Adelaide. Get outdoors at Aldinga Beach and Carrickalinga Beach. 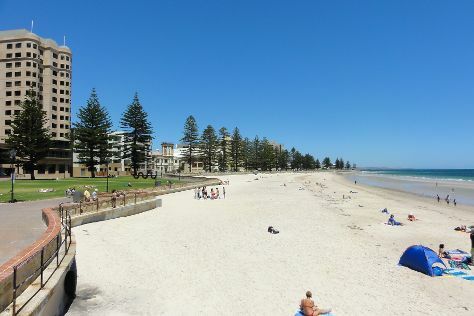 You'll enjoy a bit of beach vacationing at Glenelg Beach and Henley Beach. Dedicate the 24th (Wed) to wine at some of the top wineries in the area. The adventure continues: identify plant and animal life at Cleland Wildlife Park, go deep underground at Unique Opal Mine Pty Ltd, take a leisurely stroll along Glenelg Pier, and don't miss a visit to Southern Flinders Ranges Experience with Lunch. To see where to stay and more tourist information, you can read our Adelaide trip planner . Fly from Melbourne to Adelaide in 3.5 hours. Alternatively, you can drive; or take a train. In April, daytime highs in Adelaide are 26°C, while nighttime lows are 14°C. Finish up your sightseeing early on the 24th (Wed) so you can travel back home.